You can open VeryPDF PCL Converter by double clicking its shortcut icon on the desktop. 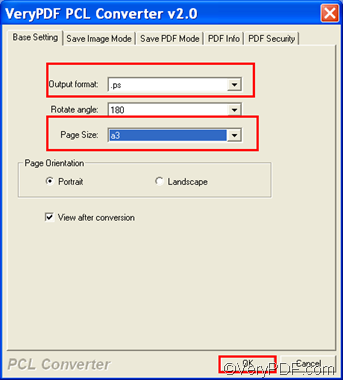 This is the quickest way to run VeryPDF PCL Converter. If you only want to try it, please click Try in the registration dialog box that pops out. Later you are going to see the interface of VeryPDF PCL Converter as below.If you have a registration key, please enter the key in the Regcode edit box and click OK. The next time you run VeryPDF PCL Converter, you can directly open the main interface. The most direct and quickest way to input PCL files is to drag the selected PCL files to the list box of the interface. When the information about the input files is displayed on the interface, you can proceed to the next step. In case you want to remove some listed PCL files, please select them in the list box, and press Delete on the keyboard. To create PS files, and to fit to paper size, you are going to set at least two options. Just click Setting on the main interface to open the dialog box as the following one. Then, you should click the Output format combo box and select .ps from the drop down list. To fit to paper size, you should click the Page size combo box, and then select a proper size from the drop down list, for example, a3. After that, please click OK.
To start the conversion from PCL to PS, and to save the output files, please click Start on the main interface. When the Browse for Folder dialog box appears, please choose a folder to export the PS files into, and then click OK. This entry was posted in VeryPDF Blog and tagged fit to paper size, pcl to ps. Bookmark the permalink.